ASHEVILLE, NC — The 2nd Annual Jam In The Trees is thrilled to welcome Acoustic Syndicate, Peter Rowan, Larry Keel, Tim O’Brien, Jim Lauderdale, Underhill Rose, Ken Tizzard to the stage for the 2017 event taking place Friday and Saturday, August 25-26th at Pisgah Brewing Company in Black Mountain, NC. More artists TBA! Early Bird Tickets available while supplies last. VIP tickets are available for $100 and include Meet & Greets with the bands, a guided brewery tour and tasting, preferred parking, a commemorative event poster and more! Doors open at 7pm on Friday for shows on the indoor stage. Gates open Saturday at 12pm, with music starting at 1pm throughout the day until 11pm on the beautiful Pisgah Brewing Outdoor Stage, followed by an “After Hours Jam” on the indoor stage. Hotel and shuttle information coming soon. Stay tuned to the festival’s new website www.jaminthetrees.com for more information and updates. JITT is a benefit for Wild Forests & Fauna (WildFF) and last year’s inaugural event raised $5000 to protect, restore and support threatened forests and wildlife in Western North Carolina. Relive some of the wonderful moments of 2016 through photos of the event by David Simchock Photography at www.frontrowfocus.com. “Jam in the Trees fit like a glove in our beautiful amphitheater, and we couldn’t be more excited to partner with this organization again in support of our most precious forests and natural resources in 2017. It’s a real win-win!” says Benton Wharton, Events/PR Director for Pisgah Brewing. More information about Jam in The Trees can be found at www.jaminthetrees.com, www.facebook.com/JamInTheTrees, www.twitter.com/jaminthetrees, and www.instagram.com/jaminthetrees. Larry Keel’s Experienced Out TODAY Friday, February 26, 2016! LEXINGTON, VA — Flatpicking guitar phenom Larry Keel dazzles music-lovers once more with his 15th self-released album Experienced, out today, February 26, 2016. Del McCoury says, “Larry Keel is a triple threat… songwriter, guitar player, entertainer. He can do it all.” The album is an entirely original work that showcases both Larry’s and bandmate Will Lee’s exceptional songwriting, singing and jaw-dropping instrumental performances, accompanied by Keel’s equally talented wife Jenny Keel on upright bass and harmony vocals. Experienced is available now at Keel’s web store (http://larrykeel.com/products-page/) and CD Baby (http://bit.ly/LarryKeel_Experienced_CDBaby). Added to the raw sophistication of Keel’s progressive acoustic style are several guest-musician-friends who appear on various tracks of Experienced, a list of artists that reads like a ‘Who’s Who’ of icons and new stars including Sam Bush, Del McCoury, Peter Rowan, Keller Williams, Jason Carter (The Del McCoury Band), Mike Guggino (Steep Canyon Rangers), and Anders Beck (Greensky Bluegrass). The album was recorded at Wally Cleaver Studio in Fredericksburg, VA with engineer (and guest drummer) Jeff Covert and mastered by the award-winning industry great Bill Wolf (Willie Nelson, Tony Rice, Doc Watson) in Arlington, VA. Experienced is on the rise on the Americana Music Association’s radio chart and currently at #25! “Keel’s record is beautiful–I love how the rawness of his voice (and playing) really lets the soul shine through the arrangements! I’ve always liked how he can go from sweet and sentimental to dirty and greasy and back. Find out more and stay up to date with news from Larry Keel at www.larrykeel.com, www.twitter.com/LarryKeel, www.facebook.com/LarryKeelFishinAndPickin. LEXINGTON, VA — Flatpicking guitar phenom Larry Keel is set to release a his 15th album, Experienced, on February 26, 2016. Keel has a variety of musical formats swirling around the calendar each year: look out for his core band, The Larry Keel Experience (featuring Will Lee on 5 string banjo and vocals and Jenny Keel on upright bass and vocal harmonies). They are set to embark on an album release tour starting in late February with stops throughout the north and south eastern States including a couple of sets at Suwannee Springfest in Live Oak, FL and a lot of pickin’ gig on at Aiken Bluegrass Festival in South Carolina. See Larry’s full list of tour dates below including a few early February dates with Keller & the Keels, as well as All-star shows in Hawaii leading up to Valentine’s Day and at Winter Wondergrass in Vail in mid-February. Experienced includes seven tracks and is an entirely original work that showcases both Larry’s and bandmate Will Lee’s exceptional songwriting, singing and jaw-dropping instrumental performances, accompanied by Keel’s equally talented wife Jenny Keel on upright bass and harmony vocals. It was recorded at Wally Cleaver Studio in Fredericksburg, VA with engineer (and guest drummer) Jeff Covert and mastered by the award-winning industry great Bill Wolf (Willie Nelson, Tony Rice, Doc Watson) in Arlington, VA.
> Friday LKE set, Sat Keller and Keels as well as Larry Keel All-star jam with Vince Herman, Mimi Naja, Paul Hoffman, Anders Beck and more! More date TBA! Stay tuned to www.larrykeel.com. LEXINGTON, VA — Flatpicking guitar phenom Larry Keel dazzles music-lovers once more with his 15th self-released album Experienced, due out February 26, 2016. The album is an entirely original work that showcases both Larry’s and bandmate Will Lee’s exceptional songwriting, singing and jaw-dropping instrumental performances, accompanied by Keel’s equally talented wife Jenny Keel on upright bass and harmony vocals. It was recorded at Wally Cleaver Studio in Fredericksburg, VA with engineer (and guest drummer) Jeff Covert and mastered by the award-winning industry great Bill Wolf (Willie Nelson, Tony Rice, Doc Watson) in Arlington, VA.
“I love me some Keels. There is a certain genuine authenticity that Larry and Jenny possess,” says Keller Williams. “When we get together, our wonder-powers unite to form a giant, impenetrable sphere of open-minded, Appalachian psychedelic goodness.” Appropriately, Keller plays on the swelling and rolling “Miles and Miles,” which is a sort of metaphoric travel log of life on the road as a musician (and as a human being)… the key being to stay true to one’s own ‘voice’. Following “The Warrior”, the album’s gentle and refreshing closing melody, “Another Summer Day,” emits the feeling of resurfacing into the world, relaxed and carefree to enjoy the daylight and breeze. The tune was written and sung by Will Lee, with Anders Beck lending his intuitive touch on dobro and Jeff Covert carrying it along with a light drum beat. Suwannee Springfest 2016 Initial Lineup: John Prine, The Del McCoury Band, Keller Williams Grateful Grass & more! Live Oak, FL — Suwannee Springfest celebrates 20 years of kicking off the spring festival season at the beautiful Spirit of Suwannee Music Park in Live Oak, FL. It takes place March 17-20, 2016 and we are thrilled to announce that John Prine will be headlining the festival with his debut appearance at the event! A lot of return favorites from over the years will be joining in to help celebrate the anniversary including The Del McCoury Band, Keller Williams Grateful Grass, The Infamous Stringdusters, Jeff Austin Band, The Larry Keel Experience, Donna the Buffalo, and Jim Lauderdale. Nicki Bluhm & the Gramblers and Dave & Dave (of Trampled By Turtles) make their debut appearance at the fest! Get your tickets for Suwannee Springfest now at the super early bird rate of $160 (GA) until midnight on Wednesday Dec 16th before they rise to the next tier of $175 through January 17th. Student / Military Ticket $175 advance through March 16th. Individual day tickets are also available. Tickets are inclusive of all taxes and fees, and include 4 days of primitive camping and music Thursday – Sunday nights. Kids under 12 are invited to join for free. Suwannee Springfest is a gem of a festival with beautiful early spring weather in a stunning natural setting of moss-draped oak and cypress trees where festivalgoers experience four days of superb music in the midst of a friendly, family-style environment. Keep an ear out for some campground pickin’ and bring your acoustic instruments to join in on the fun! Located just north of Live Oak, Fla, the Spirit of the Suwannee Music Park is a one-of-a-kind music park and premier campground nestled in 800 acres on the shady banks of the historic, tea-colored Suwannee River in North Florida. With multiple stages, miles of trails and over 800 acres for camping, hiking, swimming, canoe and kayak rentals on the river, horseback riding, disc golf, and a restaurant and country store; the park offers a unique experience like no other, a true playground for all that attend. Attendees can reserve RV hook ups, cabin rentals, and golf cart rentals by calling the park. SOSMP is located between Jacksonville, Florida & Tallahassee, Florida about 30 minutes south of the Georgia State line, about 45 minutes north of Gainesville and is host to a variety of events. Please visit the park’s web site at www.musicliveshere.com or call them at 386-364-1683 for information. 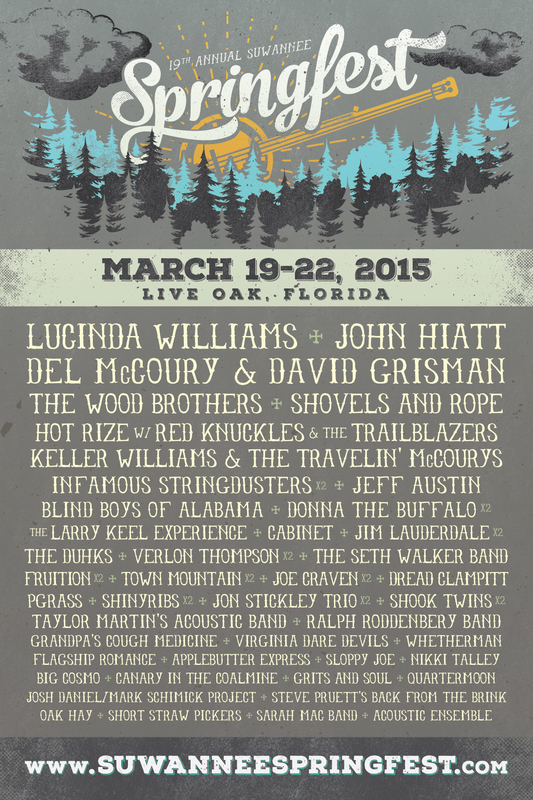 Live Oak, FL — On March 19-22, 2015, the 19th annual Suwannee Springfest kicks off the spring festival season at The Spirit Of Suwannee Music Park in Live Oak, FL. A gem of a festival with beautiful early spring weather in a stunning natural setting, Suwannee Springfest is thrilled to announce a few additions to the already stellar lineup. Additions include Lucinda Williams, John Hiatt, Del McCoury & David Grisman, Hot Rize with Red Knuckles and The Trailblazers, Jeff Austin, The Duhks, Pgrass, Virginia Dare Devils, Whetherman, Flagship Romance, The Applebutter Express, Big Cosmo, Canary in the Coalmine, and Acoustic Ensemble. Bands that have already been announced to perform are The Wood Brothers, Shovels and Rope, Keller Williams and The Travelin’ McCourys, The Infamous Stringdusters, Blind Boys of Alabama, Donna The Buffalo, Larry Keel Experience, Cabinet, Jim Lauderdale, Verlon Thompson, The Seth Walker Band, Fruition, Town Mountain, Joe Craven, amongst others. Festivalgoers experience four days of superb music in the midst of a friendly, family-style environment with good times including music from usual festival favorites, as well as lots of talented new faces in Bluegrass & Newgrass, Acoustic Blues, Roots Rock, Singer/Songwriter, Cajun/Zydeco, New & Traditional Folk and other forms of American Roots music. Along with the camping, there are nearly 12 miles of trails suitable for hiking, biking, horseback riding and nature exploring. For RV hook ups, cabin rentals and golf cart rentals, please call SOSMP at (386)364-1683. SOSMP is located between Jacksonville, Florida & Tallahassee, Florida about 30 minutes south of the Georgia State line, about 45 minutes north of Gainesville and is host to a variety of events including Wannee, Magnolia Fest, Bear Creek Music and Arts Festival, Hulaween, and Aura Music Festival amongst others. Please visit the park’s web site at www.musicliveshere.com or call them at 386-364-1683 for information. Get your tickets in advance for Suwannee Springfest and save for $160 until February 28th; $175 from March 1st through March 18th; and $200 at the gate. Individual day tickets are also available. Student / Military Ticket $150 Advance. Tickets are inclusive of all taxes and fees, and include 4 days of primitive camping and music Thursday – Sunday nights. Kids under 12 are invited to join for free. Attendees can also upgrade for a VIP Experience which includes a four-day ticket with primitive camping, dinners Thursday – Saturday evenings, a VIP Laminate, a swag bag with the festival poster, a cap, and other goodies for $300 through February 15th ($350 from 2/16 on and at gates. If you purchase a VIP Ticket you will be entered into a drawing for a pair of upgraded All Access Passes. Please visit SuwanneeSpringfest.com for ticketing and other information. Further information can be found at suwanneespringfest.com. Also visit us at facebook.com/suwanneespringfest, twitter.com/SuwanneeSpring and instagram.com/SuwanneeSpringfest. 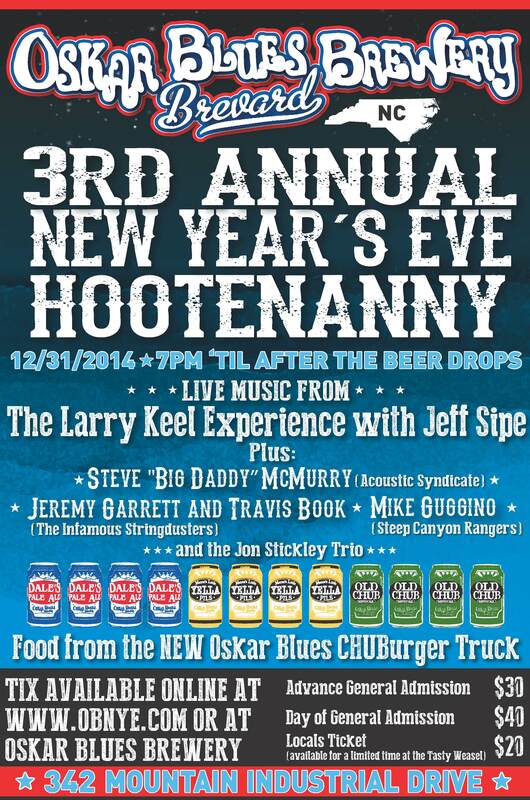 The Larry Keel Experience is excited that Jeff Sipe is joining the band for the evening to perform at The 3rd Annual Holiday Hootenanny at Oskar Blues Brewery in Brevard, NC on Wednesday, December 31, 2014. Based in Lexington, VA, the Larry Keel Experience is Larry Keel on acoustic guitar and lead vocals, Jenny Keel on stand up bass and harmony vocals, and Will Lee on Banjo and lead vocals. Also performing for NYE are Jeremy Garrett & Travis Book (of the Infamous Stringdusters), Steve “Big Daddy” McMurry (of Acoustic Syndicate), Mike Guggino (of the Steep Canyon Rangers), and the Jon Stickley Trio. The NEW Oskar Blues CHUBurger food truck will be slingin’ the goods throughout the evening and a photobooth will be onsite to capture all of your NYE memories (so that you don’t have to). Hotel specials are available, just check the Oskar Blues website for more info. The Oskar Blues trolley will be making the rounds to local hotels and downtown Brevard to give you a safe ride to and from the Hootenanny. Trips will start at 6 p.m. and the trolley will stop at each stop roughly every 30-40 minutes. Tickets are on sale now and more information is at http://brew.oskarblues.com/events/nye-brevard. The CAN’uary 1st Hangover Brunch will be hosted the following afternoon at noon at the Oskar Blues REEB Ranch, their new 145-acre farm that is located about 8 miles from the Brevard-based Oskar Blues brewery in Hendersonville, NC. The January 1, 2015 brunch will be hosted by Jeremy Garrett, Travis Book, Sarah Siskind, and Larry & Jenny Keel. Proceeds from the brunch will benefit Oskar Blues CAN’d Aid Foundation. Included in the $80 ticket price (or as part of the NYE package deal) are a Southern-style family-style meal, drinks (including Mama-mosas and Café con FIDY), and the exclusive VIP concert. Limited tickets are available. The CAN’d Aid Foundation will give an update on their work in our community and the work ahead in 2015. Larry Keel has had a fantastic 2014 and is excited to celebrate with you! Some highlights include his appearance with Sam Bush at this year’s Lockn’ Festival and he’s been on tour with Yonder Mountain String Band throughout South east, Mid West, North East this fall. He’ll be heading to Puerto Morelos, Mexico w/ all the Bluegrass buddies to play Strings and Sol in Mexico in mid-Dec. Also, stay tuned for more information on an upcoming studio release due out in the spring of 2015 with some very special guests! Larry Keel is described by some reviewers as the most powerful, innovative and all-out exhilarating acoustic flatpicking guitarist performing today. Keel has absorbed the best lessons from his Bluegrass family upbringing, both sides deeply steeped in the rich mountain music culture and heritage of Southwest Virginia. From there, he has always integrated that solid musical grounding and natural-born talent with his own incomparable approach to flatpicking the guitar and composing original music. He’s also got a knack for choosing interesting and appealing material from all realms of music with guts, whether it’s a tune written by a fellow songwriter/musician friend, or a tasty cover from any number of genres all over the map. Keel has a variety of musical formats swirling around the calendar each year: look out for his core band, The Larry Keel Experience (featuring Will Lee on soulful, blues-grass 5 string banjo, penetrating vocals and exceptional song-writing contributions and Jenny Keel on upright bass, with impeccable timing, solid yet imaginative bass lines and vocal harmonies). “Hot and fluent bluegrass act showcasing Larry Keel’s dazzling guitar skills and gruff, baritone vocals, wife Jenny’s granite-firm bass guitar work… Good folks, amazing roots music,” writes Tad Dickens with the Roanoke Times. 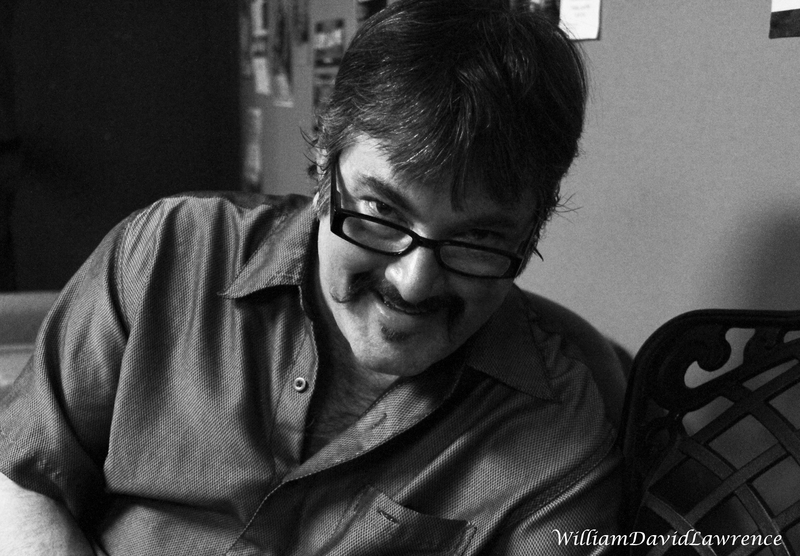 Other projects of Keel’s include Larry Does Jerry (Keel performing the music of Jerry Garcia), Keller Williams and The Keels, Keel paired with artists such as Drew Emmitt, Danny Barnes, Peter Rowan, Sam Bush, and a multitude of guest spots in great bands on the tour circuit including the Traveling McCourys, Steep Canyon Rangers, Infamous Stringdusters, and Greensky Bluegrass. The versatility of his talents is pretty irresistible, and has earned Keel the highest respect and billing among the top acoustic musicians alive, and some now gone: Tony Rice, Chris Thile, Vassar Clements, Sam Bush, Del McCoury, John Hartford, Bill Monroe, Peter Rowan, and Darol Anger to name a few. And his fierce, high-spirited energy also appeals to young rockers, jammers and alt country pickers and fans who are equally drawn to Keel’s deep rumbling voice, his earthy and imaginative song-writing, and his down-home-gritty-good-time charm. Keel regularly collaborates with JamBand and Rock giants Yonder Mountain String Band, Keller Williams, Jorma Kaukonen, David Nelson, Little Feat, Rebirth Brass Band, Dirty Dozen Brass, Railroad Earth, members of String Cheese Incident and Leftover Salmon, amongst others. Throughout his career, Keel has released 14 albums and is featured on 10 others. The most recent release, March 2012, is CLASSIC, the 3rd album recorded by Keel and his powerhouse ensemble, Natural Bridge. The project is filled with originals written variously by Keel, the band members or by musician/song-writer friends. “Classic is not a derivative work stuck in the quagmire of a romanticized past. It’s forward-thinking, spontaneous, audacious, and full of surprises. Fresh. All the Keel’s are doing is watering the seeds the old Masters planted and widening the Circle a little bit,” writes Robert Kimmel with Bluegrass Today. ^ The CAN’uary 1st Hangover Brunch with Jeremy Garrett, Travis Book, Sarah Siskind, and Larry & Jenny Keel. Proceeds from the brunch will benefit Oskar Blues CAN’d Aid Foundation.